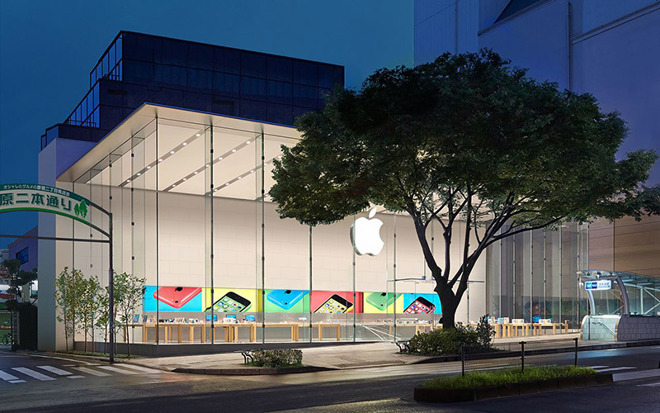 Apple retail chief Angela Ahrendts this week said the company plans a major Japanese investment that will see the opening of new retail outlets and an extensive renovation of existing locations over the next five years. In an interview with Nikkei, spotted by Mac Otakara, Ahrendts said Apple has a "five year plan" for reinvesting in Japan. Currently, Japan accounts for about 9 percent of Apple's sales, with a large chunk of revenue generated through online purchases or third-party resellers. Unlike the U.S. or the UK, which boast numerous Apple-run stores, Japanese customers can only visit six locations, seven if you include an outlet in Tokyo's Shibuya ward that is temporarily closed for renovations. For perspective, Ahrendts said Apple now has 501 stores in operation worldwide. That will soon change, however, as the company plans to open a new store in Shinjuku next month. Though not a flagship, Shinjuku will be the first in Japan to sport a "town square" design concept common to most recently opened Apple outlets, Ahrendts said. "Starting with Shinjuku, we will open several new stores, and existing stores will also undergo extensive renovation," she said. A collaboration between Ahrendts and CDO Jony Ive, the "town square" concept aims to make Apple stores, and the products that lie within, a central hub for shoppers and passersby. Often nestled in a cocoon made of floor-to-ceiling glass panels, elements like custom-made wooden accessory displays and demonstration tables, large spaces for educational presentations and a wide-open sales floor create an environment suitable for internal initiatives like Ahrendts' Today at Apple sessions. Launched last year, the Today at Apple program sees Creative Pros guide customers through tailor-made lessons covering music, photography, videography, drawing and more on Apple products like iPad and Mac. Special events include live performances by local musicians and artists, all of which are free to attend. Apple hosts about 15,000 Today at Apple sessions each week at participating stores around the world, Ahrendts said. She added that there are already some customers who have returned to their local store six times to participate in different sessions, citing data from a survey program that began in January. While Ahrendts declined to detail where Apple plans to expand within Japan, she did mention previous discussions about Tokyo being ripe for investment. When the Shinjuku outlet opens, the nation's capital will boast four full-size Apple stores and an Apple Watch pop-up.